Dottie Price taught for thirty years in K-5 classrooms in the Houston Independent School District. 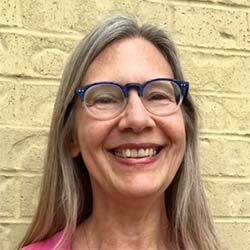 She is ESL and GT certified, with extensive training and experience in writers and readers workshop and the International Baccalaureate Primary Years Program. A fervent believer in the value of the arts in education, Dottie created the Elders Songwriting Project, a collaboration between schools and retirement homes in which students have written 240 tribute songs for Elder interviewees. Most recently, Dottie is focusing on helping schools and districts implement Balanced Literacy effectively and thoughtfully. In her work with teachers, Dottie models ways to help students develop skills and habits of writing and reading that empower them to realize and organize their thoughts and feelings and to communicate them with each other and the world. Dottie has a B.A. in psychology and education from Lawrence University and pursued graduate work in developmental psychology at the University of Houston and in special education at the University of Wisconsin, Oshkosh.